I’ve got jeans and a jumper on, and I’ve just been out in an overcoat and scarf. Of course it can only be the second of June, in Britain. I’ve done my Juneathon challenge for today by going to BodyPump class. At some point this month I’ll explain what BodyPump is and what to expect in a class. It’s one of those classes that looks scary from the outside but is actually quite fun to do. Plus there’s no jumping. Too much exercise involves jumping and sometimes you just need a day off. Or at least your knees do. I still have about another 5,000 steps to do to complete my daily target of 12,000 on the Fitbit fitness monitor. If the hideous weather keeps up it could be time for emergency measures AKA marching on the spot in front of trash TV. My lovely teenage daughter has offered to support the challenge by going running with me. Considering she has never run before, and my running capabilities are pretty woeful, I’m very touched by the offer. She didn’t even ask if she could bring some books. Interestingly, in talking to people about the Juneathon challenge, several have said that they could keep up with exercising every day, but would struggle with the daily blogging element. If this is you, remember you can still be a Juneathon-er and just tweet or mention it on social media every day. Come to think of it, I bet there are people who blog every day but say they have no time for exercise. They’re missing a trick. The next few days will be interesting because I’ve been called out to work. I was becoming too hermitty working from home so I’ve got a part time job as an exam invigilator, and this being exam season, it’s going to be busy. The good thing about that job, though, is that you walk up and down a lot. Better charge up the Fitbit. 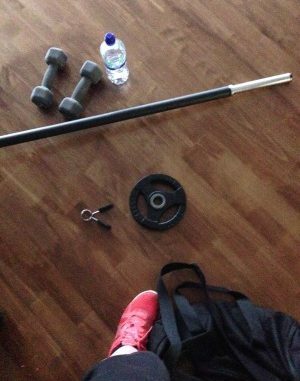 However, I won’t be able to get to my regular gym classes so I’ll have to find another way to fit the exercising/blogging in. I’m doing #Juneathon – pray for me!